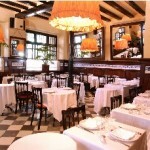 7 Portes is a restaurant operating since before 1850, and is very popular among visitors to Barcelona. 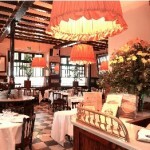 Here you can enjoy great Catalan food and of course brilliant Spanish wine. The restaurant is located not far from the Barceloneta (metro stop), and can be warmly recommended for you and your friends while in Barcelona.